"It is important to give children confidence not criticism"
First off, I would like to apologise for being unable to meet my commitments for this weekend’s coaching sessions. After a medical procedure a few weeks ago I unfortunately picked up a bladder infection that has apparently grown so fond of me that it simply refuses to go away. Hence, I am confined to barracks for another few days. Anyway, after my last offerings on this indubitably fine website I wish to delve further into the characteristics of what constitutes a good Coach. The essential requirement in all walks of life in the pursuit of success is to keep things as simple and straightforward as possible. The simpler your message the more interest you attract, the more people you influence and the greater the continuity you generate. The temptation to complicate things by talking too much is one of the original sins of Coaching. In truth, less is more and the individual who grasps this maxim and utilises it to proper effect is already a Coach of significance. With this in mind I offer for your perusal and consideration the following aspects that will undoubtedly help you become the Coach you want to be. To achieve your true potential you must continue to learn, nurture your passion and most importantly of all find joy in your journey. Coaching can take you into a different mind-set and alleviate the stress of everyday life. Focus is everything, both in life and sport, as it takes you away from irrelevance and artificiality and guides the mind into a sharper and more insightful state. Target relevant areas for continuous improvement. Act on lessons learned consistently. Develop a plan for your own improvement and work on implementing it. Concentrate on your good points rather than worry about your weaknesses. Its one step, then the next and the next. Only really comes about when you step out of your comfort zone. What is your target for growth? Are you in charge of your desires or is it the other way round? Too often overlooked. It is essential to concentrate on performance not on result. All too often a good result can hide imperfections. We have all lost our cool. Think about it after and consider how you could have responded more effectively. Never beat yourself up. It is impossible for even the great Coach to understand everything. Finally for this week, it is my intention to concentrate on getting my message across to as many of you as I can. 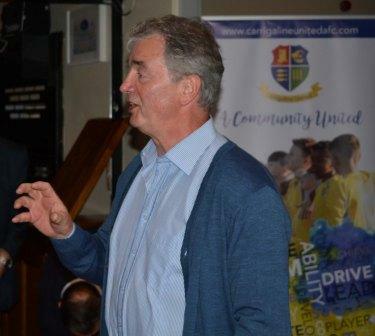 To this end, I will put on seminars, coaching sessions and have conversations with the Carrigaline United Coaching Staff as often as is possible in person, and, through the medium of the club website. It will be difficult to individualise any of these events because of the restriction of time, so I ask you to try to attend sessions when you can. There will always be times for questions and discussion and for afterthought I am available on my email address, which is ricocarrigaline @gmail.com. IT IS IMPORTANT WE GIVE CHILDREN CONFIDENCE NOT CRITICISM. It is also advisable we do exactly the same to ourselves. Do let me have your thoughts on this weekly presentation and feel free to offer suggestions (through the above email address) that you feel might make our relationship more effective. "Know what you want and know how to get it"
I took my first coaching course at Charlton Athletic Football Club in South East London whilst I was still playing for Gillingham FC. I was 28 years old at the time and it was a course run by the FA in conjunction with the Professional Footballer’s Association. There were about 20 pro footballers from various clubs in and around the London area taking the course and it was both educational and hilarious. However, at that time the FA Coaching Department was influenced and staffed by many ex-teachers and the first session in a classroom - with the chalkboard choker-full of the complicated eight-week process that lay ahead - provoked three players to depart the course post haste. A great number of pro footballers in those days had few fond memories of their schooldays. As the course progressed I enjoyed it more and more but I did find the schoolteacher attitude of some of the coaching staff a little overbearing and there were a few clashes of style between staff ands players. But that was the atmosphere that prevailed in the FA at that time and we simply had to grin and bear it if we wanted to gain our Preliminary Badge, as it was called at the time. I must explain that as pro footballers we did not have to go through the whole process of the coaching system and were allowed skip the earlier stages that teachers and ordinary club coaches had to undergo. The FA felt that the coaching system needed the adornment of players from the professional game to give substance to their coaching plan. I had played international football for the Republic of Ireland as had Terry Mancini who was with Arsenal at the time, and George Armstrong also of Arsenal, had represented England. So even in out little group there was a fair degree of worthwhile publicity for The FA as it tried to raise the profile of the coaching qualification system. I then started my coaching career in schools in London and Kent. After training in the morning at Gillingham FC I would drive to Shooter’s Hill Comprehensive School in the Royal Borough of Greenwich, again in South East London, and spend the afternoons coaching different classes. Mostly it was just small-sided games, but I also assisted the teachers in charge of the various school teams and I gathered some proper, and precious, coaching time over the two or so years I was there. I then changed schools and mover to Temple Secondary School in Kent and spent three very happy years there improving my coaching skills and being paid for it as well. In this period I gained the FA Full Coaching Badge, which at that time was accepted as the most prestigious coaching qualification in the world of professional football. I also coached the Gillingham Youth Team, which benefitted me enormously as it was quite satisfying to finally coach really talented young players. I became a good Coach, fully qualified, at the relatively young age of 31, which was a double edge sword in some respects because when I retired from full-time football and went into non-league football in Kent I stopped coaching and became a double glazing salesman. What I learned during those years was that everybody has his or her own style of coaching. Terry Mancini for example was a coaxer, who could quickly build a rapport with people and was very effective. George Armstrong was very quiet but could demonstrate superbly, which minimised his quietness but he was not so effective. Surprisingly most pro footballers do not become good Coaches. I personally learned how to best use my voice- and my Irish accent- and I also adopted a style that later assisted me when I became a manager, i.e. I found I could blend with different types of people and understand their individual personalities (which of course, was also beneficial when I later became a salesman). Perhaps this to an extent came about from working in a tough London school that very often necessitated diffusing difficult situations. I meandered along this trip down memory lane to try to demonstrate what influences I had that helped shape the type of Coach I became. Each one of you will equally have experienced circumstances that helped formulate the type of Coach you are and in turn I hope I can use my experience to also influence the type of Coach you will become in the future. In this respect one of the primary questions I will be posing to you is what type of Coach do you think you are at this moment? It is also important for you to decide what type of Coach do you want to be in the time ahead. An expression you will hear a lot from me is “Know what you want and know how to get it” which I hope is self-explanatory. We all fully understand there are various reasons why people become Coaches. But once involved the natural inclination surely is to become the best Coach you possibly can and many factors enter into the equation at this juncture. Desire, ambition and time available allied to a progressive outlook from both Coach and Club are the essential factors that elevate a Coach to a higher level of performance. The rate of advancement is to a great extent driven by the Coach and it is my professional inclination to respect each individual Coach and appreciate how much involvement they wish to instigate. If we all combine and commit our talents and our goodwill to this extremely exciting project the atmosphere created will be a most positive one and it is my belief that improvements will come in a very natural and enjoyable manner. What I have witnessed so far in the Coaching Department at Carrigaline United has been very pleasing and I truly believe there is a strong solid base on which to build some genuine progressions.